Take U.S. 287 north from Ft. Collins to LaPorte, then turn left onto CR52E. Continue up Rist Canyon 13 miles. Park at the stop sign located after the steep downhill. Ride dirt road west of intersection. You can also ride Old Flowers Road as a loop in combination with Pennock Pass Road, but we recommend doing that with an experienced rider so you don’t miss the critical turn. Popular 4WD road that is closed to off-highway vehicles. Trail initially borders private property. Please do not trespass. Don’t let the word “road” scare you off. This is one of the best mountain bike rides in our region. The climbs are among the toughest around and the descents are fast. Not for novice riders. 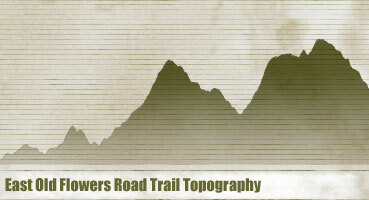 Our elevation profile image (below) shows the trail as ridden east to west–one way.